Let’s see if this makes sense: there’s no truly difficult part of climbing Bondcliff in New Hampshire’s White Mountains and the Pemigewasset Wilderness. The first 50 percent of the hike covering the Lincoln Woods Trail and Wilderness Trail is all flat, heavily traveled ground. Yes, there are a few steep sections on the Bondcliff Trail—show me a 4,000-foot mountain in the Northeast that doesn’t have some serious ups—but even these are quite forgiving by White Mountains’ standards. So why the second most difficult trail rating on Northeast Hikes? What the Bondcliff Trail lacks in challenging terrain is more than accounted for in sheer distance. A 17.6-mile round-trip day hike is no joke in the summer, add winter’s coat and you better eat your Wheaties. Not to mention have a fixed turnaround time. The bridge over the East Branch of the Pemigewasset River at the Lincoln Woods Trail head. The hike begins at the Lincoln Woods Visitor’s Center by crossing a suspension bridge over the East Branch of the Pemigewasset River. 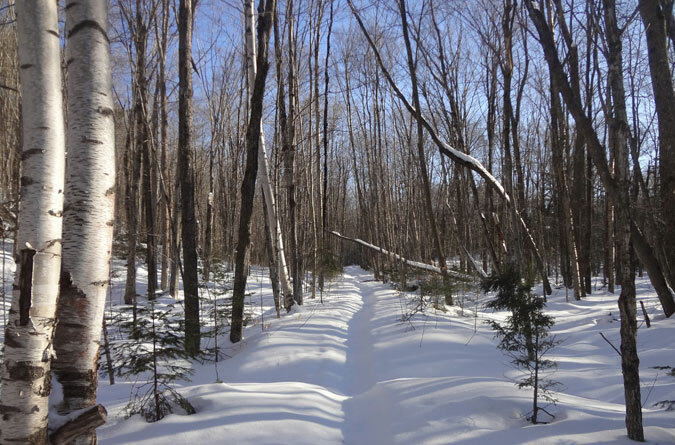 The first 2.6 miles of the Lincoln Woods Trail is wide enough for a delivery truck and heavily packed from a steady stream of snowshoers, cross-country skiers and dog walkers, many of whom are destined for the Osseo, Black Pond or Franconia Falls trails. Never mind the necessity of the Lincoln Woods Trail, many people come here for the pure beauty. Arrive early to beat the crowds and in winter you’ll be rewarded with views through the bare-limbed trees of Mt. Flume basking in the morning sun, along with a multitude of short side trails to the East Branch river that offer enjoyable rest spots. Glimpses of Mt Bond can even be seen in a few places along the river. While it’s easy to appreciate Mother Nature at her finest during the beginning of the hike, it’s worth noting that on the way out, when your feet are screaming uncle and your legs are reduced to jello, this section can be monotonous, laborious, over crowded, and seemingly never ending. What a difference 15 miles can make! After 2.6 miles on the Lincoln Woods Trail, at the junction with the Franconia Falls Trail, there’s a footbridge crossing Franconia Brook. The footbridge crossing Franconia Brook on the Lincoln Woods Trail. The upstream view crossing the Franconia Brook footbridge. I believe that’s Mt. Flume in the background. Upon crossing Franconia Brook, the Lincoln Woods Trail soon turns into the Wilderness trail, a name change signified by the entrance into the Pemigewasset Wilderness. The Wilderness Trail provides a 1.8 mile trek to the Bondcliff Trail, a stretch that is every bit as easy going as the Lincoln Woods Trail, but in winter receives a fraction of the traffic. I had the pleasure of being reminded that the early bird gets to break trail. Normally I relish these opportunities, but facing a foot of fresh snow with 14.7 miles of hiking remaining, I got to thinking dinner plans with the family were out the window. My packed water supply was also in question. The Bondcliff Trail veers off on the left, and for the early going is every bit as easy as the Wilderness Trail. Much of the Bondcliff Trail covers old logging roads with several Black Brook crossings. These are mostly frozen over in the winter, except for one open spot that I fortuitously reached on the return trip just as my Camelbak ran dry. Even when open this brook crossing was passable in snowshoes. After a steep section the trail opens up and crosses what in the summer is a loose gravel bank. In the winter this is easy once the path has been broken, but can be formidable with thigh-deep snow when there’s no semblance of a trail. This open spot also offers a sneak-peek view of Bondcliff and the remaining climb. Depending on the fullness of your glass, this can either be rejuvenating or crushing. One can almost see the Bondcliff summit from this open spot. Does this leave your glass half empty or full? The snow-covered gravel bank. Steeper and deeper than it looks. After the gravel bank the trail dips into the final brook crossing and climbs for a short bit up the steep bank on the opposite side. Most of the remaining hike is a long, gradual, horizontal ascent of Bondcliff’s sharp upper slope. The wild and seemingly innocent upper section of the Bondcliff Trail. On the way back down, near where the above photo was taken, I reached a spot packed by snowshoers with no one in sight. At first I thought it was a mirage and was happy for the illusion of an easier trail. A little further along I caught up with the group of five. When asked if I’d made it to the summit, I felt sheepish answering in the wake of their (likely) difficult decision to turn around when they were so close. Hats off to them for knowing when to fold ’em. In many regards that’s a bigger accomplishment than summiting. Speaking of reaching the summit…remember when I said there were no difficult parts on the Bondcliff Trail? That may have been an itsy-bitsy, teeny-weeny, fib. Just before treeline there’s a ledge that can be tricky in winter. It’s the one spot where a mountaineering axe would come in handy. Naturally, I’d left mine in the car. Using my trekking poles, knees, and nearly every other body part for leverage, I was able to get over the hump. The view of Mt. Lafayette, Mt. Lincoln, and the Franconia Ridge once above treeline on the Bondcliff Trail. The last jaunt to the Bondcliff summit is all open and exposed, so it’s a good idea to gear up first. The higher elevation winds were reported to be in the 65-miles-per-hour range on this day, which I believed after being knocked on my keister. The open ridge is mostly ice and hard-crusted snow; crampons would be useful here, but since I didn’t plan on continuing to Mt. Bond or dillydallying on top, I kept my snowshoes on to save time. Connect the cairns to the Bondcliff summit. In winter with all the ice it’s especially important to exercise caution (not to mention common sense) around the cliffs. Steer well clear in inclement weather, ideally by not summiting in conditions where visibility is compromised. When the views are unobstructed, this climb is every bit worth the grueling 8.8-mile trek back. The view of West Bond from the Bondcliff summit. The Bondcliff Trail’s open ridgeline ascent of Mt. Bond. Mt. Washington is visible in the background on the right.